NEW InvestComics Hot Picks every week before New Comic Day on Wednesday! It’s Superbowl Sunday 2014. 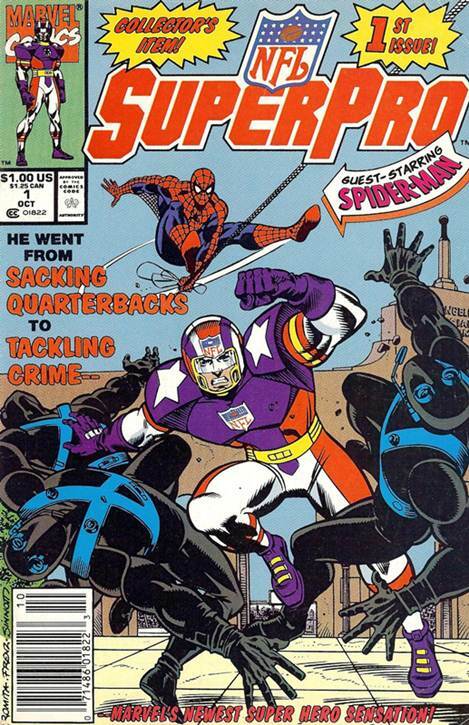 The NFL’s first appearance in a big market company came in 1991’s NFL SuperPro #1 from Marvel Comics. Creators attached were Nicieza, Delbo, DeCarlo, Frenz, Sinnott, and Legend John Romita Sr. Nice line up right? And a Spidey appearance! Too bad the comic is pediatrics office material. If anything, it was a fun comic! One particular comic really has our attention this week. No it’s definitely not Ms. Marvel #1, more on her in a bit. But the comic that has our ears peered up is Marvel Knights Spider-Man (2013) #5. Not only does this issue possess a very cool cover from Marco Rudy, but a history making comic here folks! Well that’s according to Marvel, so we’ll take this with a grain of salt. Curiosity does have the best of us here though. The issue promises “….the craziest two page spread in comic book history!” Yes, you read that right. Now Marvel must deliver. What do you think? Will they? Take it off the shelf and take a looksee. DC will be milking the recent success of Jokers Daughter with the release of Batman Joker’s Daughter (2014) #1. The character still remains a mysterious one as does the speculation market. As DC rams the character down our throats, look for pricing across the board to level off……a lot. Simply put, too much of a good thing is never good. Holding back a bit on the Jokers Daughter would help the speculative market immensely. Giving a steady diet is what the doctor should order here, but we know that’s not going to happen. DC will beat this character to death to the point no one will care about her. A perfect example of this would be the Lobo character back in the day. Of course it’s happened countless times since then, but Lobo was so hot at one time and then just sort of faded away because of the overkill. Deadpool comes to mind too. Marvel released a new number one issue last week with “Deadpool” in the title and retailers are probably trying to figure out a way to give them away at this point. Too much of a good thing is not always good. Case in point with Punisher (2014 10th Series) #1 and Ms. Marvel (2014 3rd Series) #1. Punisher was in that same boat at one time, appearing in every single comic imaginable. Frank Castle even teamed up with Archie at one point. Although his first appearance in Amazing Spider-Man #129 (1974) is a steady book, it’s become a “slow” steady book. Still a good investment, but you’ll have to wait a while for any sort of real return on that comic. A good hold book these days. You know what Carol, Sharon, Karla, Deidre, and Kamala all have in common? They were all Ms. Marvel’s at one time. Now with Marvel’s latest Ms. Marvel #1 they are doing what any normal business model would do and that’s a money grab. Nothing wrong with making money right? But when it comes at the expense of selling an ethnicity, it’s a bit disappointing. Marvel did the same exact thing with Miles, an African American Spider-Man. Marvel can spin it anyway they’d like, but they got what they wanted and that’s major press on that announcement. The same holds for the press they received on the new Ms. Marvel. Yes she’s Muslim. She’s the first Muslim Super-Hero ever in the Marvel Universe. Why must we go down this road again exactly? Money, yes that’s right. All this being said, Captain Marvel #14 (2013), the first appearance of Kamala Khan and the Ms. Marvel #1 issue will reward nicely in the aftermarket because of the ridiculous hyperbole surrounding it. Do not, I repeat, do not think holding onto this comic will bring bigger fortunes down the road. It will not. Marvel will realize after a 12 issue run or so, with slumping sales, they’ll cancel the series and Ms. Marvel, no matter what race will go back to being that third rate character……in turn leaving you with a bunch of worthless comics. Let me clarify one thing though. There is absolutely nothing wrong with a having an African American or Muslim super-hero. Why not just do it without the fanfare? Exploiting a superheroes ethnicity, sexuality (gay), and or any other human element for a mere profit instead of awareness is not educational but a lack of judgment of making these superheroes to be “different” and not within the fabric of society as everyday people, but outsiders. I like to think we’re better than this. Marvel throws another Wolverine #1 (relaunch) at us. Number 5 for those keeping score at home. Wolverine (2014 5th Series) #1 will be as big a bore as it’s expected to be. He’s holding a gun on the cover. Wow. Loki brings the same sentiments here with Loki Agent Of Asgard (2014) #1. This cover is a huge bore, sorry Jenny Frison, but you’ve done much better. In X-Men (2013) 3rd Series #10 we will see the recruitment of two female characters, Typhoid Mary and the Enchantress. Typhoid Mary’s first appearance in Daredevil #254 (1988) was a hot commodity at one time. Nowadays you can probably find this comic in the 50 cent long boxes. Still a very cool book to own if you don’t already. Journey Into Mystery #103 features the first appearance of the Enchantress. Jack “King” Kirby is all over this comic. A must own. Captain America (2012 7th Series) #16 will focus on Jet Black once again. Her first appearance happened way way back in Captain America #1 of this series. Superior Carnage gets his own annual this week; Superior Carnage (2013) Annual #1. Looks like a great read, check it out. Ghost Solider will be making their presence known again in Action Comics (2011 2nd Series) #28 this week. Check out the first appearance a couple of issue prior in #26. Green Lantern (2011 4th Series) #28 will be one of those cool flip issues, with Red Lanterns #28. All that with a $2.99 price tag. One of the best buys this week has to go out to Turok Dinosaur Hunter (2014 Dynamite) #1. Definitely get one of the higher end variants to flip. As always a CGC signature series (9.8 or higher) will fetch the most bucks. Look for a sellout on this book and a spike in the Valiant series from 1993. And no you’re not seeing double, the Dynamite cover pays homage to the Valiant series. At least we hope Dynamite relates that someplace, otherwise it’s a ripoff. If you’re looking for a bunch of first appearances in one comic this week, check out Sonic Universe (2009) #60. And also check out the new comic from Image Comics Apocalypse Al (2014) #1. Writer J. Michael Straczynski on this one, a sure sellout, and you better get your hands on this one. Next School is Out! Your First Look at WOLVERINE & THE X-MEN #42!